The opposition Maldivian Democratic Party’s (MDP) branch in Haa Alif Dhidhoo has called for an investigation into the finances of Progressive Party of Maldives (PPM) MP Abdul Latheef Mohamed over alleged unexplained wealth. The ruling party lawmaker has has spent between MVR3 million (US$194,552) and MVR5 million (US$324,254) in the Dhidhoo constituency during the past year, the MDP claimed, but he does not have business interests or “any other legitimate [sources of] income” apart from the parliament. 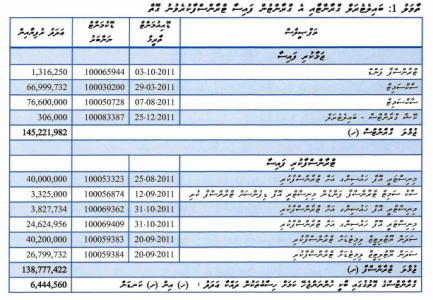 An MP earns a monthly salary of MVR62,500 (US$4,050) in addition to a committee allowance of MVR20,000 (US$1,300). Since winning the parliament seat in March last year, Latheef has funded an MVR100,000 (US$6,485) Quran competition, an MVR100,000 football tournament, and an MVR500,000 (US$32,425) music show in Dhidhoo with the Olympians band. Latheef has also donated an MVR700,000 (US$45,395) laboratory machine to the Haa Alif atoll hospital, offered scholarships worth MVR2 million (US$129,701) for two constituents to study medicine overseas, and organised an MVR200,000 (US$12,970) Quran competition this Ramadan. “As the above-mentioned expenses could not have been made from the one-year salary of a People’s Majlis member, many citizens of Dhidhoo have been asking the MDP Dhidhoo branch to find out how he is getting the money,” the party’s Dhidhoo branch said in a statement on Thursday. The statement added that many Dhidhoo constituents allege that Latheef has amassed wealth through bribery and corruption. The Dhidhoo branch called on the Anti-Corruption Commission, the auditor general’s office, and other relevant authorities to investigate Latheef’s finances. The constitution requires MPs to submit “a statement of all property and monies owned by him, business interests and liabilities” annually to the parliament’s secretary general, but the financial statements are not publicly disclosed. Latheef told Minivan News today that he did not wish to comment as he had “no interest” in the MDP Dhidhoo branch’s statement. The MP previously told opposition-aligned private broadcaster Raajje TV that allegations of corruption should be filed with the relevant state institutions. Government, private, and foreign companies have provided assistance for charitable activities in Dhidhoo, he said. The MDP meanwhile noted that both domestic and international organisations have expressed concern with bribery and illicit enrichment in Maldivian politics. Last week, anti-corruption NGO Transparency Maldives called for the criminalisation of illicit enrichment and urged the government put in place a comprehensive framework for identifying and prosecuting cases. Ahead of last year’s parliamentary polls, Transparency Maldives also noted a lack of transparency in political and campaign financing. “When political parties and individual candidates do not fully disclose where they get their money from, it is not clear who funds them, what their potential conflict of interests are, and, thereby allows vested interests to override public interest when elected as MPs,” the NGO observed. The former Maldives Ambassador to the European Union (EU) was paid US$17,000 as a special allowance from September to December 2011 in violation of regulations governing allowances and benefits for employees at diplomatic missions, auditors have revealed. As the allowance was not given to other ambassadors, Auditor General Niyaz Ibrahim recommended recovering the funds from the responsible officials. The report noted that allowances and benefits for staff at overseas diplomatic missions were specified in regulations enacted by the President’s Office and that the foreign minister did not have the power to authorise such payments. Auditors also discovered that the former ambassador withdrew the US$3,500 allowance twice in October 2011. Additionally, €7,566 was deposited to the ambassador’s bank account as a representational grant. The regulations state that representational grants should be provided as reimbursement once bills of expenses incurred in the performance of diplomatic duties are submitted, the report explained. However, the report noted that the ambassador did not submit bills for €7,566 worth of expenses. Former ambassador Didi resigned from the post in July 2012 after 32 years of service. The audit report also flagged discrepancies between the Foreign Ministry’s annual financial statement and its general ledger at the Finance Ministry, which were not reconciled. While MVR145 million (US$9 million) was included in the general ledger as bilateral grants, officials at the ministry informed auditors that they were unaware of the inclusion. Auditors discovered that the Finance Ministry transferred MVR138 million (US$8.9 million) of the grant aid to various state institutions, leaving MVR6.4 million (US$415,045) unaccounted for. The auditor general recommended an investigation by the Anti-Corruption Commission into the hiring of a British national as a senior advisor at the Maldives mission to the EU in March 2010. Auditors discovered that two employment contracts were signed with the advisor in March 2010 by the foreign minister and state minister respectively, noting that auditors could not confirm which of the two agreements was valid. While the agreement signed by the foreign minister stipulated that the advisor must be given six months notice before termination of the contract, the agreement signed by the state minister stipulated a four month notice period. The advisor was paid €25,992 as salary and health insurance for six months when the contract was terminated in June 2011. Among other cases flagged in the report, auditors found that MVR52,122 (US$3,380) was spent on business class plane tickets for the deputy high commissioner to the UK and his wife to travel to the Maldives in late 2011 in violation of the regulations, which state that only the high commissioner could travel on business class. A total of MVR64,080 (US$4,155) was meanwhile spent in 2011 to celebrate the ministry’s 78th anniversary in violation of regulations. The report also noted that the state-owned residence in London – Rosemont Avenue number 10 – had fallen into disrepair as a result of poor maintenance. While the residence was transferred under the care of the Education Ministry in mid-2011, the report noted that it was not fit for use. The audit report further revealed that the Maldivian Ambassador to Saudi Arabia as well as the embassy’s counsellor were paid allowances for periods when the pair were away on official trips and vacations. As 13,957 Saudi riyals and 11,568 Saudi riyals respectively should have been deducted from the allowances in accordance with the regulations, the auditor general recommended recovering the money either from the pair or the officials at the Foreign Ministry responsible for the oversight. The auditor general also recommended recovering MVR137,676 (US$8,928) spent out of the ministry’s budget to pay mobile phone bills for the foreign minister in 2011 as a phone allowance for ministers had not been approved by parliament. Moreover, MVR192,416 (US$12,478) was spent to settle mobile phone bills of foreign ministry staff in violation of rules set by the Finance Ministry and Civil Service Commission. The ministry’s audit report for 2010 had revealed that MVR235,001 (US$15,240) was spent to pay the minister’s phone bills. The Maldives Road Development Corporation (MRDC) purchased material worth MVR2.2 million (US$142,671) without a bidding process, the 2011 audit report (Dhivehi) of the 100 percent government-owned company made public last week has revealed. 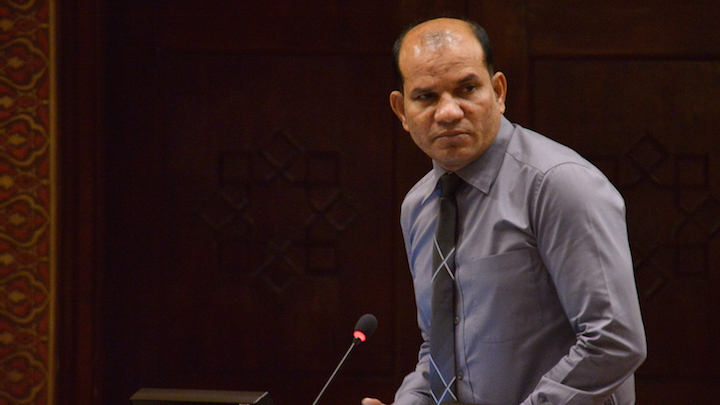 Noting that the MRDC has not formulated procurement rules to date, Auditor General Niyaz Ibrahim recommended drafting regulations in consultation with the Finance Ministry within a period of one month. “As a large amount of the company’s money had been spent for various purpose without establishing sound rules, and as we believe the company’s board members have been negligent in carrying out their responsibility of protecting the company’s resources, action should be taken against [the board members] to hold them accountable,” the auditor general recommended. The MRDC was formed in August 2010 by the administration of former President Mohamed Nasheed to facilitate road construction under a sustainable business model. In the absence of the financial statement, the report stated that the auditor general’s office was unable to assess the company’s financial health, assets, and the results achieved during the year. The report further noted the lack of a mechanism to collect information required to compile the financial statement, adding that “basic documentation” of business transactions was not properly maintained. The audit office recommended legal action against the officials responsible for failing to submit the financial statement for auditing as mandated by the company’s charter and the Company’s Act. Moreover, as the MRDC had not maintained an updated registry of its assets, the report stated that auditors could not verify whether all assets purchased for the company’s purposes remained in its inventory. The absence of an updated registry leaves open the opportunity to sell off the MRDC’s assets, the report noted. The auditor general also recommended establishing a sound accounting system to record daily financial transactions. While MVR175,039 (US$11,351) was spent in 2011 as overtime payments for staff, the report noted that auditors could not verify whether the payments were made for services received. Moreover, upon scrutinising available financial records, auditors discovered that bills and invoices of materials sold by MRDC did not include purchase orders from customers while quotations sent to businesses were not authorised by senior officials. The MRDC audit came on the heels of a damning report on the Works Corporations, which concluded that the government-owned corporation was mismanaged and had not served its purpose. Of the 34 infrastructure projects awarded to the company, the report noted that only one had been completed. Meanwhile, the audit report of the state-owned Waste Management Company released in December revealed that a board member had embezzled MVR610,000 (US$ 39,354) by doctoring cheques.